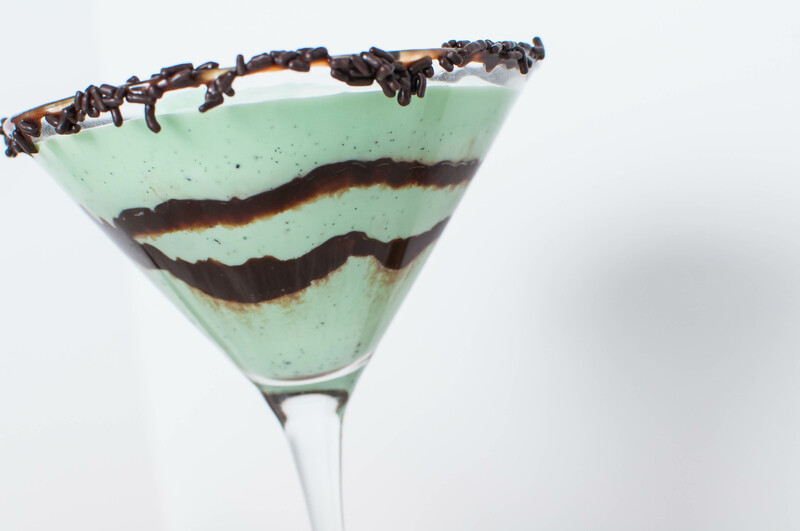 I’m back at it with Breyer’s and I’m bringing this deliciously simple Mint Chocolate Mocktini recipe. Isn’t it so stinking festive!?! I don’t know about you but I’m the kind of person that can eat ice cream when it’s 20 degrees outside. Ice cream for life. For those of you who don’t quite share my adoration of ice cream at any temperature, you may not think of reaching in the freezer to create a holiday dessert. But Breyers has created some great holiday recipes using their signature products and festive flavors that will be hard for even you to resist. I really love this Frozen Peppermint Cookie Hot Chocolate for a fun, cold twist on a winter classic. This creative and fun spin on a milkshake will make your kids go crazy. It’s fun for them to have a fancy drink along with the adults and it’s fun for us when it’s quick and simple. You know what else is magical about this drink? There’s a boozy version for the grown ups. And I mean, it’s the holidays so the answer is always yes to that. Mint chocolate chip is my absolute favorite ice cream flavor so I knew I would love this mocktail shake. The best part is the chocolate sprinkle rimmed glass. As you drink the milkshake I took some of the chocolate and sprinkles along with it for the perfect sip. These would be so fun for your Christmas Eve or New Years Eve celebration. Squeeze 2 tablespoons Ice Cream Sauce onto plate. Pour Chocolate Sprinkles onto another plate. Dip rim of 2 martini glasses into Ice Cream Sauce, then Chocolate Sprinkles. Squeeze 3 tablespoons Ice Cream Sauce into plastic zip-top bag and snip off small piece from 1 corner. Pipe sauce into glasses starting at bottoms and working up to tops to create swirl patterns; set aside. Process Breyers® Natural Vanilla Ice Cream, milk, food coloring and extract in blender until smooth. Pour into glasses and serve immediately.